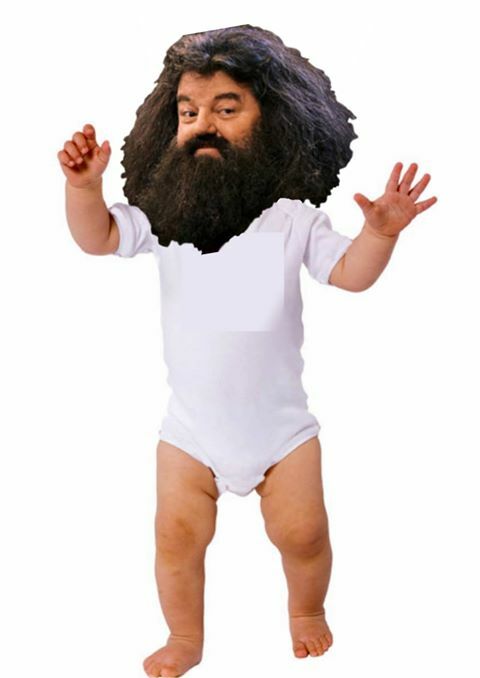 Baby Hagrid - Man vs. Baby - The battle between an innocent, helpless, wide-eyed creature… and their newborn baby. So, this week, I accidentally called a woman’s baby: ‘Hagrid’. 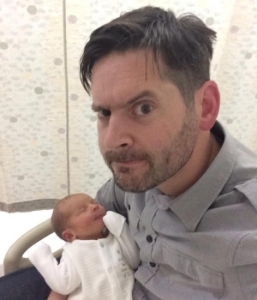 To explain…when I very first posted about this parenting stuff, I suggested that all babies are indistinguishable and that they all look like Ross Kemp. (What I actually said was that all babies look like one of the Mitchell brothers.. if you’ve got an ugly baby.. its Phil). Anyway, after eight months I’ve started to be able to distinguish between the babies at our drop-in health clinic. Only thing is, I don’t know their names.. So, just in my head, I use nicknames..
There’s one baby that’s always chewing on his mum’s clothes, I call him ‘The Moth’, there’s one kid that looks a bit like Jeff Goldblum who I call ‘Jeff’. And, there’s another that, for some bizarre reason, is always dressed in army camouflage trousers.. I call him ‘Delta Force’.. you get the general idea. The thing is, there is one supremely hairy baby who I got into the habit of thinking of as ‘Hagrid’. (I’m not proud of it). Anyway, as I walked in this week, in a sleep deprived state, saying hello to everybody, I accidentally blurted “hey Hagrid”.. The mum just stared at me.. I did try get and away with it by saying “Oh, er.. I call him Hagrid, y’know just because he’s such a big strapping lad”. Writ1e us your thoughts about this post. Be kind & Play nice.